Hello, readers! I’m addressing you under the assumption that you do exist, but I have a sinking feeling that, for a while at least, I’m just going to be shouting into the void that is the internet, hoping a few people can hear me. That’s okay, though. You know why? Whenever anything bad happens in the months after summer and before winter, those words soften even the hardest of blows. I. Love. Fall. The crisp autumn breeze that ruffles my hair, the dappled sunlight that winks through the trees seeming to wish me a good morning… I could regale you for hours on the subject of everything that I love about fall (which is everything) but I’ll digress. Something else that’s great about fall? Fall foods! Oh, yeah. Look at that beauty. Ladies and gentlemen, this is an acorn squash. It may be small in stature, but my god, slice that baby up and put it in the oven at 375 degrees for half an hour and tell me it doesn’t fill your kitchen with an aroma that makes the angels sing. Yes, squash is one of those simple pleasures that can make any fall day that much brighter. It’s flesh is simple but far from mundane and great in a multitude of recipes. 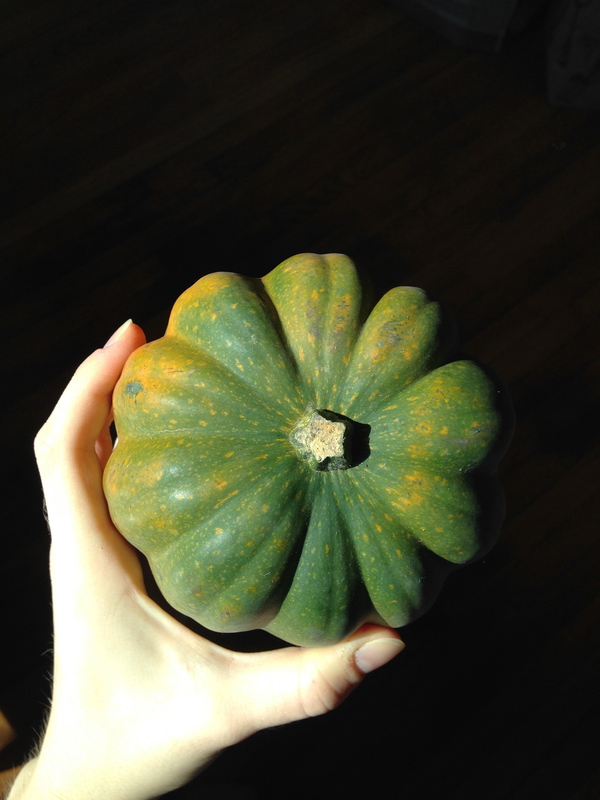 I’m partial to this variety because, being a fairly petite person, it’s the smallest and most portable type of squash for me to lug home, but that doesn’t mean I don’t love others just as much. Butternut, spaghetti, pumpkin, summer…my mouth starts watering just thinking about all the possibilities. Squash is simple to prepare, and makes a great addition to salads, as a side dish, or filled with quinoa or wild rice for a hearty dinner. Or, if you’re a purist like yours truly, just eat it on its own with a fork and (my embarrassing pleasure) a dollop of ketchup. So. Good. And wait, don’t discard the seeds! Rinse them in a colander, pat dry with a paper towel, sprinkle with salt and roast for 25 minutes at 300 degrees. They make a perfectly crunchy snack, and feel free to experiment with roasting them with different combinations of spices to add interest and flavor. I haven’t done this yet, but I’d love to try chipotle with brown sugar or a pumpkin spice blend. Hey, I don’t have a problem with real pumpkin spice- just the sugar-inundated, chemically packed crap that a certain chain coffee shop has so rudely called by the same name. Anyway, the fall season is great, despite the fake flavors that so many now associate with it. Personally, I think it’s a great time to make hearty, vegetable and squash based recipes that run the gamut from spicy and savory to rich and sweet. This month, I’m looking forward to using traditional fall ingredients like squash in new and exciting ways and offering warming recipes to fill you up with food and fall spirit- that is, if you aren’t already. My next post will honor another of my favorite hearty winter vegetables that’s perfect for roasting: the sweet potato! Until then, I’ll just be instagramming pictures of leaves and miniature pumpkins and sweaters and stuff. If you’re interested, you can follow me @sonyamarxdances. Ooh, leaf pile! That’s all for now.